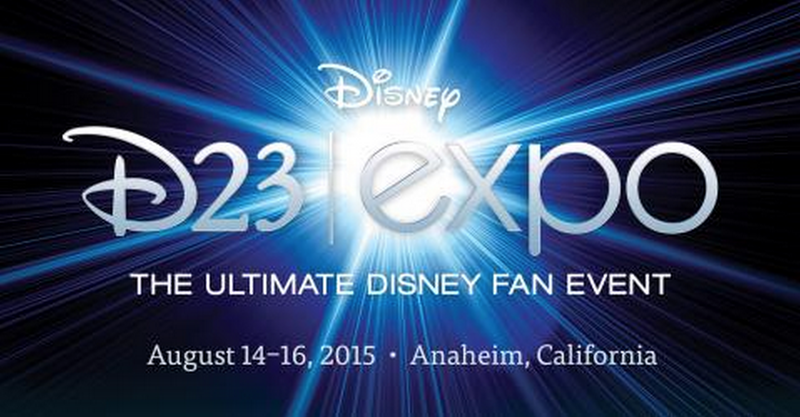 This was our first year attending D23 and we were blown away. The sheer amount of awesomeness at this event has us already yearning to attend it all over again NEXT YEAR! Announcements about Star Wars, Toy Story, Avatar and Iron Man nearly sent fans into a frenzy each time they were announced. Here is a quick recap. Disney has announced a line-up of new attractions and entertainment coming to its theme parks around the world during the D23 EXPO 2015 in Anaheim, Calif.
Walt Disney Parks and Resorts Chairman Bob Chapek gave 7,500 lucky fans a behind-the-scenes look at what’s to come. He was joined by Imagineers working on these projects as well as legendary filmmakers James Cameron and Jon Landau who shared new details about Pandora – The World of AVATAR including the names of the land and E-ticket attraction – AVATAR Flight of Passage. Fans also got a chance to see Marvel legend Stan Lee in a cameo appearance where he posed as an unsuspecting fan during Iron Man’s dramatic entrance. Among the many announcements Chapek shared were new and enhanced Star Wars experiences coming later this year to the Florida and California theme parks, plans for a new Toy Story Land at Disney’s Hollywood Studios, and more details on Pandora—The World of AVATAR, which is already under construction at Disney’s Animal Kingdom. Chapek also shared that Soarin’ Around the World will make its U.S. film debut at Epcot and Disney California Adventure taking guests to new places around the world. 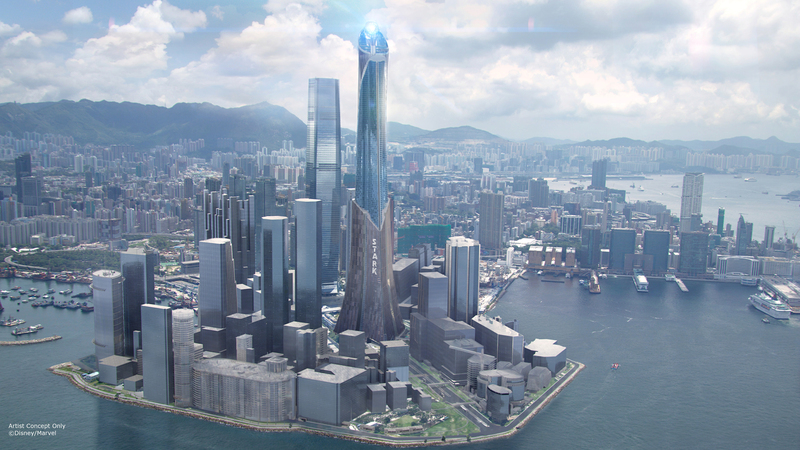 Additionally, fans got a preview of exclusive video of the first Marvel attraction planned for Disney parks, coming to Hong Kong Disneyland in 2016. 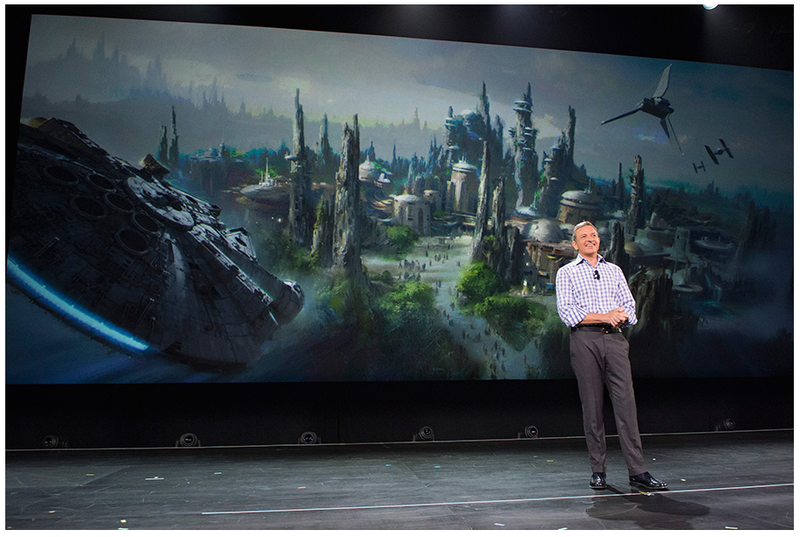 In addition to these announcements, Chapek talked about the exciting news announced earlier in the day by Chairman and CEO of The Walt Disney Company Bob Iger for plans to bring Star Wars-themed lands to Disney’s Hollywood Studios in Orlando and Disneyland park in Anaheim. Each 14-acre land will transport guests to a never-before-seen planet with two signature attractions, including a customized secret mission on the Millennium Falcon and an epic Star Wars adventure that puts guests in the middle of a climactic battle. 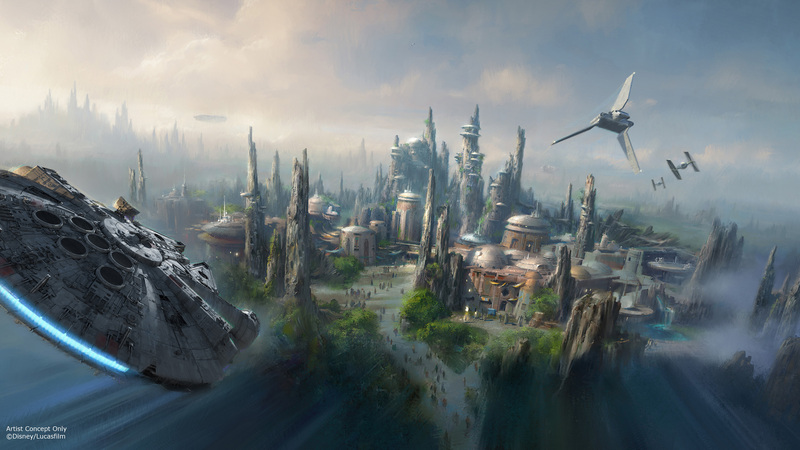 From a new Star Tours adventure to Star Wars Launch Bay, from a new Jedi Training Academy to “Season of the Force,” soon guests will be part of both new and enhanced experiences at Walt Disney World Resort and Disneyland Resort. 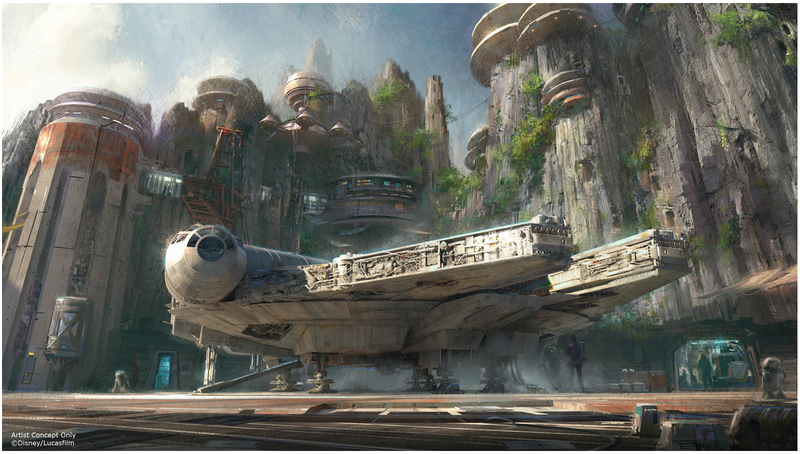 · Star Tours – The Adventures Continue – Later this year, Star Tours will include a new adventure featuring locations and characters from the upcoming film, Star Wars: The Force Awakens, giving guests a new adventure in the Star Wars galaxy. 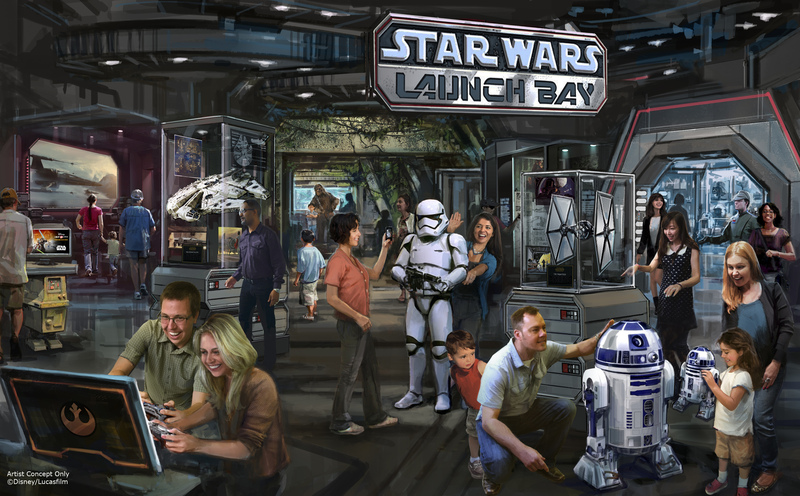 · Star Wars Launch Bay – This interactive experience will take guests into the upcoming film, Star Wars: The Force Awakens, with special exhibits and peeks behind-the-scenes, including opportunities to visit with new and favorite Star Wars characters, special merchandise and food offerings. Star Wars Launch Bay will be located in the Animation Courtyard at Disney’s Hollywood Studios and in Tomorrowland at Disneyland park. Also atDisneyland park, Star Wars Launch Bay will share the space with the reimagined Super Hero HQ, featuring opportunities to meet and take photos with super heroes like Captain America and Thor, as well as experience the returning Iron Man Tech Presented by Stark Industries. Both experiences will be available for guests later this year. · Season of the Force – This new seasonal event, beginning early 2016, brings new experiences to both coasts. In Tomorrowland at Disneyland park, guests will explore the Star Wars galaxy with special entertainment throughout the land, themed food locations and more. 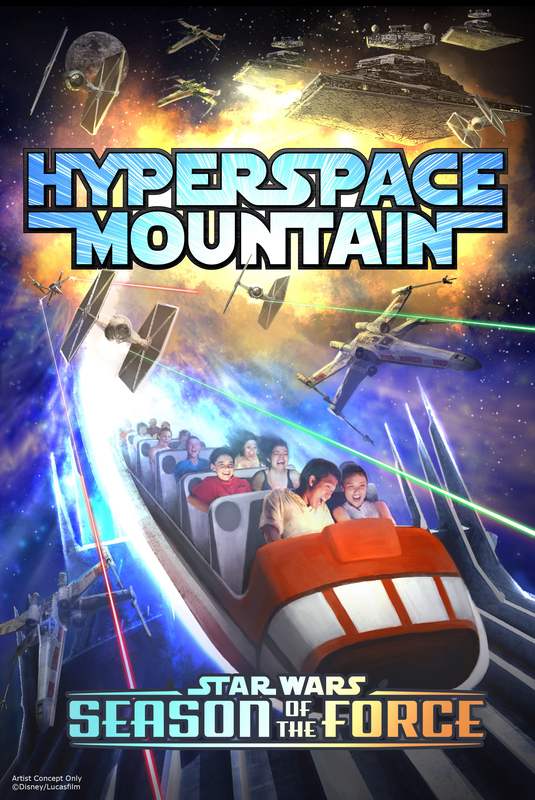 Guests also will be thrilled to climb aboard Hyperspace Mountain, a reimagining of the classic Space Mountain attraction, in which guests will join an X-wing Starfighter battle. At Disney’s Hollywood Studios, guests will close out weekend nights with a new fireworks spectacular set to the iconic score of the Star Wars movies. 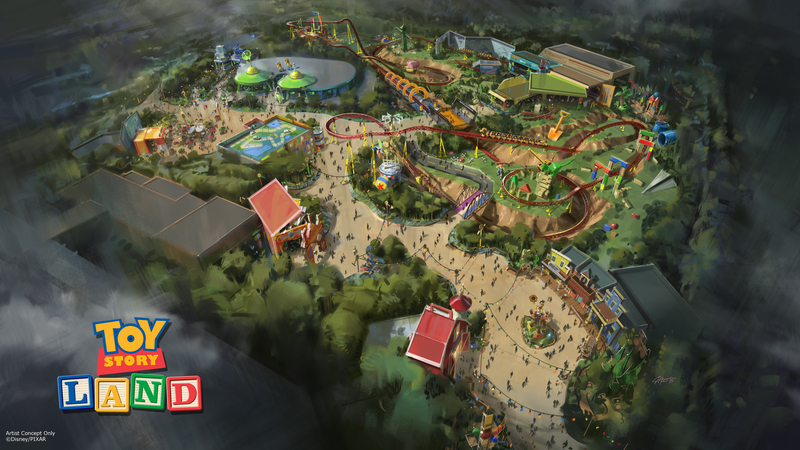 · Family-friendly roller coaster – All on the back of Slinky Dog, this coaster will zip and zoom, plunge and coast as it takes guests on a fun, toy-filled adventure throughout the new land. · Alien saucers attraction – The famous little green aliens from the movie will take guests around for a spin in their very own flying saucers. The music, lighting and sound effects add to the flurry of action, while “The Claw” looms over. · Toy Story Mania! – Guests glide into the Toy Story Midway Games Play Set and take aim at 3D objects in a variety of fast-paced games, with an expansion that adds a third track to this popular attraction. · “Rivers of Light” – Expected to open next spring, “Rivers of Light” will be an innovative experience unlike anything ever seen in a Disney park, combining live music, floating lanterns, water screens and swirling animal imagery. “Rivers of Light” will magically come to life on the natural stage of Discovery River, delighting guests and truly capping off a full day of adventures at Disney’s Animal Kingdom. · Kilimanjaro Safaris – This popular attraction will be extended for a new nighttime adventure next spring, where guests will travel through the African savanna amid the magically extended orange glow of the setting sun and discover two species new to the attraction: African wild dogs and hyenas. · Pandora – The World of AVATAR – Disney’s Animal Kingdom guests will journey into the magnificent world of Pandora at this new AVATAR-themed land – a world that includes floating mountains, a bioluminescent forest and the winged creatures known as Banshees, giving guests a transformational experience they will never forget. o AVATAR Flight of Passage – This E-ticket attraction, the centerpiece of Pandora, allows guests to soar on a Banshee over a vast alien world. The spectacular flying experience will give guests a birds-eye view of the beauty and grandeur of the world of Pandora on an aerial rite of passage. Iron Man landed at D23 EXPO today for a special appearance, and soon Hong Kong Disneyland guests will have the opportunity to meet and take photos with the Super Hero himself. 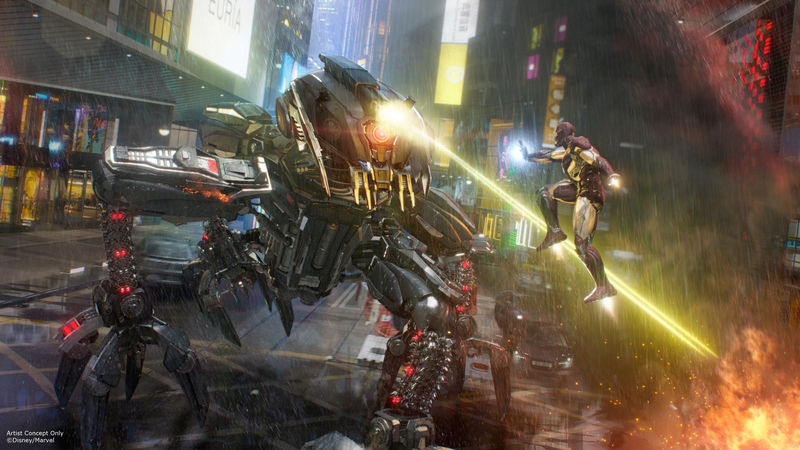 Set to open in 2016, Iron Man Experience will be the first Marvel attraction at any Disney park, taking guests on an epic adventure over the streets and in the sky above Hong Kong. The adventure will begin at the new Stark Expo where guests board the Iron Wing to take flight and battle Hydra alongside fan-favorite Avenger, Iron Man. Yep if you are like us, your mind was just melted into galactic goo. We can’t WAIT for ALL of these things to come to fruition! This entry was posted in DISNEY, Event, Pixar, Star Wars, Super Heros and tagged Avatar, D23, Disney Parks, Flight of Passage, Iron Man, Jedi Training Academy, Kilimanjaro Safaris, Marvel, Pandora, Pixar, Rivers of Light, Season of the Force, Star Wars, Star Wars Launch Bay, Toy Story, Toy Story Land, Toy Story Mania!, Walt Disney Parks. Bookmark the permalink.